This month, we take stock of the LOCUS journey and think ahead towards local impact investing in 2019. Our team has had a busy 2018 as we continued our mission to empower place-focused institutions around the country to explore impact investing; unlock assets by identifying investment areas and partners; and deploy their capital for catalytic change in their communities. Throughout the year, we saw interest grow rapidly as the world of philanthropy recognizes place-based impact investing as a tool for transformational community change, a complement to its traditional grant-making role. We’ve been proud to support foundations navigating this burgeoning space, having engaged with 45 projects this year alone. Working across 35 states and Washington, D.C., our team has partnered in 109 engagements since 2010, many through the Center for Rural Entrepreneurship, which merged with LOCUS in 2017. As interest in the impact investing field grows, we will continue putting our community development philanthropy and finance expertise to work helping foundations understand their critical role in economic prosperity and place-based impact investing. We will continue to help foundations identify investable opportunities and partners, mitigate their financial and social risks, amplify the social impact of their investments, and enhance operational efficiencies. Here’s a quick look back at some of our efforts in 2018…and a look forward at the trends we see for 2019. LOCUS has had a rich 2018, giving us the privilege to work with a variety of partners towards mission-aligned investing. We partnered with The Kresge Foundation, a Michigan-based, nationally focused philanthropic organization to better service its growing social investment portfolio. We partnered with San Francisco-based family office Ceniarth to offer due diligence and underwriting on two prospective CDFI investments in persistently-poor, rural communities. With support from the Kansas Health Foundation and in partnership with The Aspen Institute Community Strategies Group, we are building the capacity of Kansas community foundations to understand their important role in community economic development and local investing for impact. This year, we completed a number of Transfer of WealthTM studies for our foundation clients and saw first-hand how a Transfer of WealthTM analysis can broaden understanding of place, deepen engagement within communities and keep wealth local. In April, LOCUS co-authored with the Chronicle of Philanthropy a report highlighting national wealth transfer numbers. The $9 trillion that is projected to pass from one generation to another illustrates the resources that philanthropic organizations across America could garner for community investing initiatives. Using their Transfer of WealthTM analyses, our partners saw just how much opportunity there may be in their own backyards. The Hillsdale County Community Foundation used its Transfer of WealthTM study to reach a better understanding of their community demographics and better tailor its donor-outreach strategies. Institutions like the Kitsap Community Foundation used its Transfer of WealthTM analysis to foster abundance thinking in their communities, challenging perceptions among many residents that an area lacks the wealth to support giving. With the help of LOCUS, Kitsap saw in their own community that $94 billion would transfer to the next generation in the coming years. With so much untapped wealth in American communities developing alongside the impact investing movement, LOCUS’ data driven Transfer of WealthTM analysis may be just the tool to help foundations capture and unlock generational wealth transfer that can be recycled and deployed for community investments in housing, main street revitalization, health care and job creation. Stay tuned for updates on how LOCUS is evolving Transfer of WealthTM methodology to address the amount of wealth that could be anchored in your place through place-based impact investing strategies. Protecting Community Impact in Opportunity Zones: Place-focused foundations are moving quickly to learn about Opportunity Zones and the role they can play to ensure Opportunity Zones are an effective tool for positive community economic development. Earlier this year, Adam Northup, LOCUS Financial Strategist, wrote about the role of philanthropy and Opportunity Zones in this blog. Scaling Impact with Back-office Support: We see a growing need to complement foundations’ impact-making efforts with cost effective and mission-aligned back office services such as due diligence, PRI servicing and portfolio management. The Kresge Foundation recently authored a blog article describing its approach to back office challenges in impact investing. Accelerating Foundations’ Readiness to Act: More place-focused foundations are exercising their community leadership muscle and developing place-based impact investing strategies. We’ve seen numerous foundations who are doing the hard, stage-setting work like community needs assessments, ecosystem building and partner mapping before they develop a comprehensive local investing strategy. This ensures alignment between community need and impact investment capital. Embracing Leadership Roles: Place-focused foundations are taking greater leadership for their local economies and, as a result, the prosperity of their communities. This was obvious at 2018 foundation gatherings like the National Conference for Growing Community Foundations and the Council on Foundation’s Inclusive Economic Prosperity convening where LOCUS served as a subject matter expert in the Midwest and South meetings. Learning and Working Together: There is growing appreciation of the broader approach required to do impacting investing well. We are seeing multiple funders working together, identifying and leveraging the work of community capital institutions like CDFIs. Regional associations like United Philanthropy Forum are facilitating learnings and services to its members. LOCUS brings its field tested expertise to these learnings, including our contribution to the Urban Institute report published earlier this year highlighting collaborative impact investing case studies. LOCUS is here to empower place-based institutions foster that prosperity through 2019 and beyond. Place-based impact investing is a nascent but growing movement with the power to generate catalytic change in traditionally under resourced communities. We encourage more foundations in the coming year to explore how it can unlock and deploy the potential of impact capital in their place. 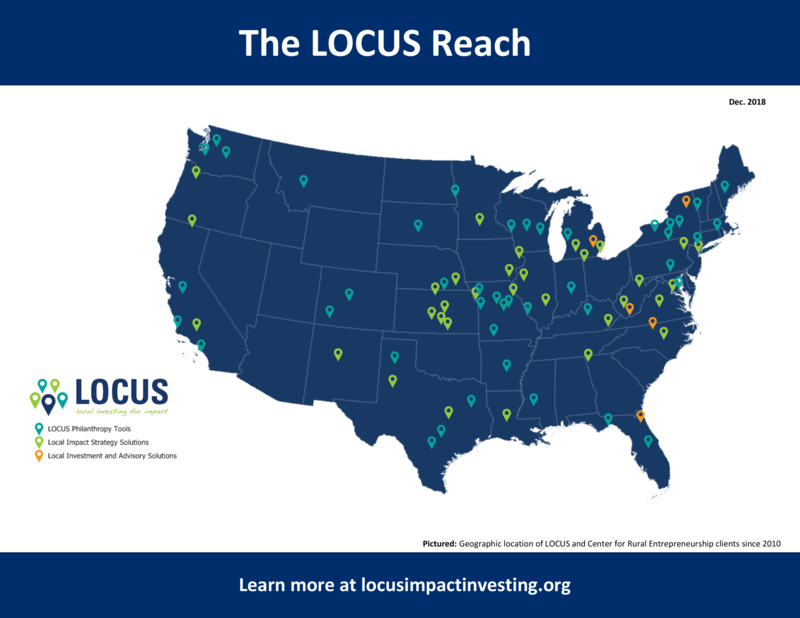 If you want to learn about how LOCUS can help place-focused foundations pursue invest their capital locally to build more prosperous, vibrant communities, please reach out to LOCUS President Teri Lovelace.